The total number of Haitian volunteers deployed on the ground in Mexico is unclear, especially since they are operating in several areas. These young Haitians could not stand idly by while survivors were still under the rubble. This spontaneous act of solidarity did not go unnoticed. In a video posted on Facebook shows Mexican citizens chanting "Haiti, Haiti, Haiti" as they applaud the efforts of these young Haitians coming to help. 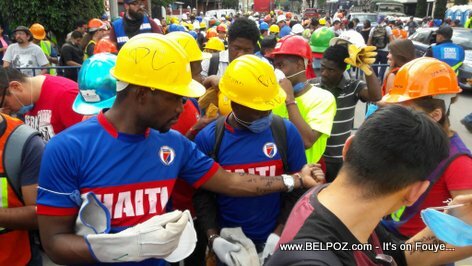 VIDEO: Watch the video here, Mexicans clapping and chanting "Haiti, Haiti, Haiti"
Mackendy Pierre Louis, Ovil Jean Alexander, Romain Etienne, Wilguens Faroule, Occilien Jessy, Noel Kertus, Thebaud Schiller, Delicieux Emmanuel, Exantus Patrick, Jessy Kaddfy Occelin, Pentoph Carl, Alexander Fegenson. 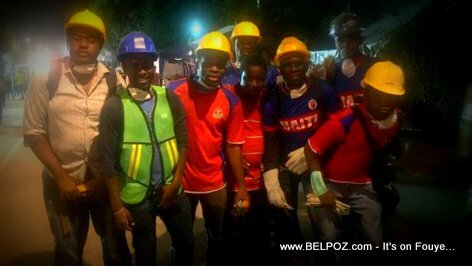 We are very proud of these young Haitians to took the initiative not to stand by and watch their Mexican brothers suffer. « TPS : Have conditions in Haiti and Sudan improved enough that they should be taken off the list?